Ous Mellouli entered 2012 with an Olympic gold medal from the 1500 free in 2008 already in his hands. He was training at USC, one of the best programs in the world, and was on a roll in swimming’s longest pool event. In April, on a bit of a whim, he took to the oceans off of the coast of Cancun for his first major international 10km swim and finished 10th. This is not a disappointing result in a World Cup event, but with just three months to go before the Olympics, it would have been a risk to pursue this event that is so vastly different from swimming in the pool. Apparently, nobody told Ous that. 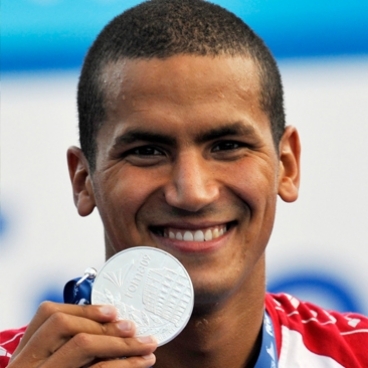 This is not the first time that Mellouli has taken a risk in swimming; at the 2011 Pan Arab Championships, representing Tunisia, he swam all but 3 events and won a stunning 15 gold medals in a single meet. Mellouli is a sporting hero in his native country and is one of their most recognized celebrities. 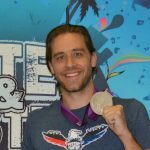 Even with an entire nation focused upon him at the Olympics, looking to him for uplifting news in challenging times, he wasn’t afraid to fail. So often it goes that those unafraid to fail are best equipped to succeed. Mellouli took the leap into the open water when he could have just settled for a defense of his gold medal in the 1500. Though nothing great was ever accomplished without a leap of faith. It’s hard to pin down exactly how he caught fire in three months and went from a respectable but inexperienced open water swimmer to the best in the world. Perhaps after spending so much time in the open water hotspot that is Southern California, he somehow absorbed the skill. Perhaps it was the work of his coach Catherine Vogt, who also trained the silver medalist in the women’s race. Somewhere along the way and through the hundreds of miles of practice, things clicked. First, in June, he won the open water last-chance Olympic Qualifying race in Portugal. Then he went to the Summer Olympics in London, England and declared himself the best open water swimmer in the world by winning the Olympic gold medal. 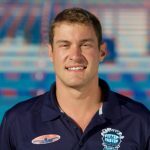 Combined with his 1500 freestyle gold from 2008 in the pool and a bronze in the same race in 2012, Mellouli accomplished two things that nobody in history has ever done. First, he won a medal both in the pool and in the open water at the same Olympics. Secondly, he became the first person in history to win Olympic gold in both aquatic disciplines. Ous’ Olympic accomplishments were a moment that will leave him remembered through the annals of swimming history. The ripples of his accomplishments will course through pools and lakes around the world and at the Fitter and Faster Swim Tour. His lesson need not be limited to Olympians. Every swimmer has the opportunity each day to take a risk, to go-for-broke, and to do more than they thought they were capable of, because nobody has ever accomplished anything noteworthy without taking a chance somewhere along the way.